Pepto-Bismol is the brand name for an antidiarrheal agent called bismuth subsalicylate. Also known as pink bismuth or “the pink stuff,” Pepto-Bismol works by “coating” irritated stomach tissues, reducing inflammation of the stomach and intestinal lining, and killing some of the bacteria that causes diarrhea. Because Pepto-Bismol is a salicylate, caution should be exercised when using Pepto-Bismol with other products and medications containing salicylates. 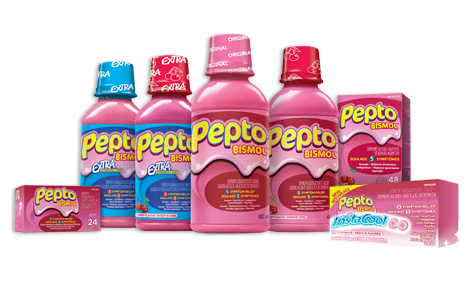 Pepto-Bismol is available in multiple varieties, including liquid, tablet and chewable tablet forms. Liquid Pepto-Bismol or chewable Pepto-Bismol tablets often boasts a wintergreen or cherry flavor. Pepto-Bismol is used to treat gastrointestinal upsets such as diarrhea, heartburn, nausea, upset stomach and indigestion in patients ages 12 and older. Liquid Pepto-Bismol and chewable Pepto-Bismol tablets may be taken as needed to relieve discomfort from these conditions. However, Pepto-Bismol should not be used to treat digestive system upsets in children younger than 12, or in children and teenagers who are recovering from a fever, flu-like symptoms or chicken pox. In rare cases, Pepto-Bismol may contribute to the development of Reye’s syndrome: a rare condition characterized by sudden brain damage and liver function problems. All forms of Pepto-Bismol should be taken according to package instructions or as directed by your doctor. Never exceed the maximum daily dosage specified on the Pepto-Bismol product label.